The wrist is a joint which connects the arm to the hand. There are eight bones in the wrist which are known as the carpal bones. Collectively, these eight bones which make up the wrist are termed as the carpus. In addition, distal ends of the bones from the arm – ulna and radius – also extend up to the wrist. Similarly, proximal parts of the bones of the hand – the 5 metacarpals – are also present among the bones in the wrist. Therefore, the wrist plays a significant role in movements of the arms as well as the hand through complex articulations of various bones. Read more detail about the bones in the wrist through the following description. The eight carpal bones fall in two different rows – the proximal row and the distal row. Each row contains four bones. Learn about the properties and importance of these bones through the following facts. The scaphoid is a boat-shaped bone in the proximal row of the carpus. The scaphoid is the most lateral as well as the most proximal of the bones in the wrist. The bone consists of a tubercle on its lateral side. Scaphoid consists of a concave surface as well as a convex surface which facilitate articulation. The bone appears at the radius side of the wrist where there is the distal end of the radius bone. The articulation of the scaphoid bone is with hamate – another carpel bone – and with the distal end of radius. The shape and size of the scaphoid bone is similar to a medium-sized cashew nut. The Lunate bone has the shape of a crescent moon. It consists of a deeply concave surface which articulates with another carpal bone, capitate. The surface opposite to the above mentioned point articulates with the distal part of radius. This articulation occurs in conjunction with the scaphoid. The bone marks its presence at the center of the proximal row of the carpal bones, between the scaphoid and the triquetral bones. Ligaments are attached to the dorsal and palmer surfaces of the lunate bone which are rough. The triquetral is one of the bones in the wrist which looks like a pyramid. The name of the bone has its origin in the Latin word “triquetrus” which literally means “three-cornered”. It is identifiable by its three surfaces of articulation. Triquetral bone comes between the lunate bone and the pisiform bone in the proximal row of the carpus. The bone consists of a separate oval facet which appears on the distal portion of its palmer surface. The medial as well as the dorsal surfaces of the triquetral bone are continuous and, therefore, non-articular. This is a small bone which appears like a pea. In fact, it is the smallest of the eight carpus bones in the wrist. It has also got another name of the lentiform bone. The bone has a placement at the junction between the ulna of the arm and the carpus. Pisiform develops inside a tendon. This small bone does not articulate directly with any other bone. It consists of a single oval facet on the proximal portion of the bone surface. There is a groove on the lateral surface of pisiform which contains the ulnar nerve – nerve running near the ulna bone. In shape, it appears like a trapezium, and this aspect is also obvious from the name of the bone. The trapezium is present between the scaphoid and the first bone of the metacarpus. The bone consists of a crest and a groove. The trapezium bone is medium in size, i.e. neither very large nor so small. It consists of a saddle like surface for articulation of the first metacarpal bone of the hand. The trapezoid bone is shaped like a small boot. It is the smallest of the carpal bones present in the distal row of the carpus. The distal surface of trapezoid articulates with the second metacarpal bone of the hand. The distal articular surface of the bone is larger than its proximal part. There is a non-articular surface on the palmer side which prolongs laterally. The capitate is the largest of the bones in the carpus. The bone has placement at the center of the bones in the wrist. You can easily identify it by its large size and a round head at the proximal end. However, the other end is square in shape. The bone articulates distally with the second, third and fourth metacarpals. This bone looks like a wedge. You can identify the hamate bone by hook like structure near its base. It is, actually, a non-articular projection of the bone, i.e. the hamulus. Hamate helps in the diagnosis of a bone disorder, the hamate carpal. 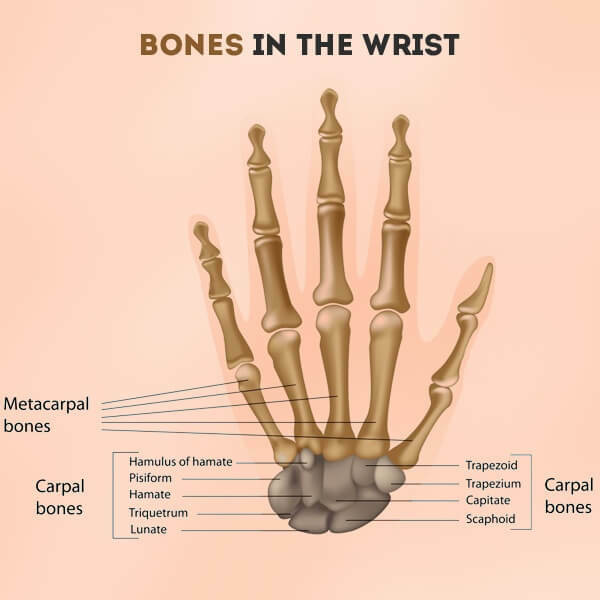 Below are some interesting facts about the bones in the wrist. Carpus is a Latin word which comes from the Greek word ‘Karpos’. The literal meaning of both the words is wrist. Although people call the “wrist” watch, it is normally worn above the wrist. Wearing it over the carpus would cause discomfort and problems in the joint movements. All the carpal bones make connection with one another by means of ligaments. This arrangement forms an arch towards the palm of the hand. The name of the scaphoid bone has its origin in the Greek word “skaphe” which literally means boat and signifies the shape of the bone. The name of the lunate bone has its roots in the word “luna” which means “moon” in Greek. The triquetral bone has also got several other names, for example, the pyramid bone, the triquetrum, triangular bone and three-angled bone. Out of all the carpal bones, the triquetral is the third most commonly fractured bone.